This special, budget-friendly drapery lining contains 70% polyester and 30% cotton, giving window treatments extra body and protecting them from sun damage. I don't need blackout and the reviews were good for this drapery lining. I have found this material to be the best for drapes. It gives them some body and protect them from sun damage. It looks like a good value, and is the fabric content I wanted. insulates - I have an old historic home and want to keep it warm in the winter! Recommended by another floral designer as a good material for a wedding aisle runner. Looking forward to trying it! I chose this fabric for its thermal properties. Roclon is very dependable lining for drapes. Because of the positive reviews by other buyers. Roclon linings are fabulous products! I am making Drapes for Christmas Season. This will help to make them warmer when closed. A wonderful, pretty fabric that is excellent for insulation. Light filters through softly. I used it for the curtain fabric itself. I need this for a photo backdrop. Good lining fabric, great price. This is a nice lining I always use on my drapes. It has a nice feel. Insulated, and apartment requires white curtain liner if windows can be seen from the street. I needed a light blocking lining that was fluid and soft. This lining works great. Have used it for many customers curtains. Great price! Need a insulating lining. Have used this before. Ron-Lon is a good product. Exactly what I need to block out the light for an excellent price! Does the suede side go against the drapery fabric, or face away? Thanks. BEST ANSWER: Most people use it so that it faces away from the drapery fabric. Is this fabric sheer? Does it flow well? BEST ANSWER: It is not sheer. It is a midweight drapery lining that has a special coating on the underside that helps protect the fabric from the sun. It is my go to drapery lining. Not sheer. Yes it does flow well. I will definitely use again! Are both sides finished? Or would a side hem need to be sewn? BEST ANSWER: The sides are finished with a selvedge edge that doesn't fray, but some people prefer to hem it because the weave of the selvedge looks different from the rest of the fabric. The sides of this lining are both finished with the selvage edge. The sides are not finished. No!!!! It is NOT AT ALL light filtering. It creates privacy (you cant see through it) but offers almost no light filtering. Will this lining block out sunlight? Hi. What is does is filter the sunlight so you will still get lightness but not total blackout. For that you would need a total blackout lining. Im making tab back curtains, first 3 panels came out great. On the 4th I decided it press it a little more. Only on wool setting. Now it isn't matching the main fabric like the others. Can this shrink with ironing? Wool setting is what I used now I'm having problems with it cooperating with my fabric. BEST ANSWER: It's most likely that the main fabric is actually stretching, making it appear that the lining is shrinking. When you iron, try not to pull it across the fabric, but rather pick it up and place it down when moving it. The lining is mostly polyester, so you may want to try the polyester setting on the iron, but I think it's more likely that the main fabric is stretching. Is this fabric water resistant? BEST ANSWER: It is not. 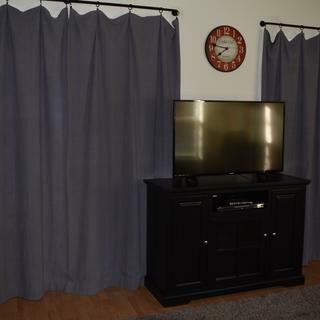 Would this fabric work as shade curtain in my RV all by itself? Does the special suede lining need to be between fabric and regular lining or would it replace the regular lining for drapes? I know interlining usually is between the two. BEST ANSWER: You can use Roclon Specialsuede by itself like other drapery linings. Whether you use an interlining or not is a matter of personal taste. Interlining gives more body to curtains and improves the insulation qualities, but many people choose not to use interlining. Would this fabric be good for upholstering a headboard? BEST ANSWER: Though this isn't a common use, we don't see any reason it couldn't be. We recommend ordering a sample to be sure that it will work for your project. Is this good for Silk drapes? BEST ANSWER: There's no way to specifically say yes or no to that since it's based on personal preference. We recommend ordering samples to figure out which drapery lining you think would work best. Are both sides of the fabric white? Is this fabric insulating to keep cold out through drafty Windows? BEST ANSWER: Yes, this drapery lining is insulating. It won't keep out all the cold, but it will help! BEST ANSWER: Yes, this is an insulated drapery lining. Does it have to be dry cleaned or can it be machine washed? Is this considered combination lining fabric? I'm looking for a lining for a linen drapery fabric that will add body. I don't need light blocking but more concerned about adding body to the linen fabric. BEST ANSWER: This drapery lining will add body, but not as much as using an interlining in addition. We suggest ordering a sample to see if this lining will work for you. Could this work for upholstery? Possibly for a seat cushion? BEST ANSWER: We do not recommend this drapery lining fabric to be used for upholstery applications. What kind of needle do you use with this lining? And how do you "pin" the lining to the facing without poking holes in the foam coating? Any tips welcomed. Thanks! Far and away the best drapery lining I have ever used and I have made a LOT of curtains. Beautiful fabric. The lining is exactly as advertised, and the white is clean and crisp looking. Drapes well ~ I made 85" lined drapes. Nice insulation and good light blocking curtains. Keep in mind that I used a fairly heavy cotton, darker color curtain fabric, (dyed painters drop cloths), but I think it is still good for light blocking lining with lighter fabric. Not complete blackout. I consider it a very good value for the quality. Packaged well and delivered very promptly. Great product and prompt delivery. Fabric was packaged extremely well.